?This book is a comprehensive guide to the diagnosis and treatment of injuries to the elbow joint incurred by athletes of all ages during participation in sports such as tennis, golf, baseball, volleyball, weight lifting, and javelin throwing. The coverage includes the evaluation and management of medial and lateral elbow pain, degenerative elbow, distal biceps and triceps tendon injuries, posterior impingement and nerve compression syndromes, dislocations, and fractures. General guidance is also provided on injury prevention, physical examination, imaging, the use of endoscopy, and rehabilitation. Clinical anatomy of the elbow is thoroughly described and a chapter on biomechanics explains the basic science of the discussed pathologies. Elbow and Sport is a book project initiated by the Elbow and Wrist Committee of the European Society of Sports Traumatology, Knee Surgery and Arthroscopy (ESSKA) with the aim of describing sports-related elbow pathologies from diagnosis to conservative or surgical treatment. 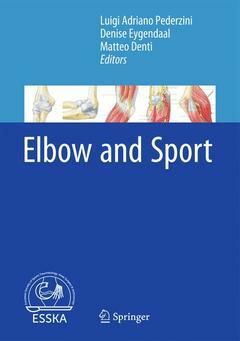 The authors include some of the most eminent experts in elbow surgery from Europe and elsewhere in the world. The guidelines proposed in the book will be invaluable for all specialists in upper limb sport lesions, including surgeons, sport medicine doctors, and physiotherapists. ​Clinical relevant anatomy of the elbow.- Biomechanics of the elbow joint in overhead athletes.- Physical examination of the elbow.- Imaging of the elbow in overhead athletes.- Preventions of elbow injuries.- Medial sided elbow pain.- New aspects in UCL stabilization.- Evaluation of medial coll rec by ultrasound.- Olecranon elbow pain in sportsmen.- Lateral sided elbow pain.- Conservative treatments in lateral elbow pain.- PRP in lateral elbow pain.- Degenerative elbow in sportsmen.- Distal Biceps tendon pathology.- Triceps tendon pathology.- Triceps repair.- Posterior impingement of the elbow joint.- Nerve compression syndromes around the elbow in sportsmen.- Endoscopy around the elbow.- Ulnar nerve problems in sportsmen.- Acute sports related injuries.- Elbow Dislocation in Extreme Sports .- Complex elbow dislocation.- Radial head fractures.- Fractures of the olecranon.- Rehabilitation of the elbow joint. Luigi Adriano Pederzini is Director of the Department of Arthroscopic Surgery and Traumatology at the New Hospital of Sassuolo, Modena, Italy. Prior to joining the New Hospital of Sassuolo, he was Director of the Center of Arthroscopic Surgery at “Casa di Cura Villa Fiorita”, Sassuolo (1998–2005). Dr. Pederzini has been a member of the Board of Directors of ISAKOS (International Society of Arthroscopy, Knee Surgery and Orthopaedic Sports Medicine) since 2011. He is also a board member of EFOST (European Federation of National Associations of Orthopaedics Sports Traumatology) and Chairman of the Elbow and Wrist Committee of ESSKA (European Society of Sports Traumatology, Knee Surgery and Arthroscopy). From 2005 to 2007 he served as President of the Italian Society of Arthroscopy (SIA), and he was President of the SIA National Congress in 2007. Dr. Pederzini has also been president of many international congresses on arthroscopy and is the author of more than 75 publications on arthroscopy of the wrist, elbow, and knee.